So it's that time of the year when I pull the ginger out and make my favorite cake, the indomitable gingerbread cake. It's one of the few cakes, I look forward to making each year and every year, I try to do something different with it. This year's version is full of fruity flavors and spice from some expected and unexpected sources. The inspiration from the flavors in this cake came from my trip to Sacramento when I visited the California Olive Ranch and learned about the different types of olive oil (and see the oil being made in action). The Arbequina variety not only comes with a bright green color but also has one of the fruitiest flavors which pairs really well with the spices in this cake. Brown rice miso is caramel colored salty fermented paste made from rice as the name suggests while mirin is a sweet rice wine, both of these ingredients are used often as seasoning agents in Japanese cooking and in this gingerbread cake, they do just that. And since, miso is rather salty to start with, there's no need for the addition of extra salt to this cake batter. Since it is the holiday season, I've made a few marzipan Christmas trees to put on top of the cake and you can make some snow with a dusting of a little confectioner's sugar. Since there's no snow where we live, I had to bring it to us! If you can't find moscovado use dark brown or light brown sugar. Jaggery is another great option. Arbequina is one of the best olive oils to use in dessert because it has a natural fruity flavor and in this cake, it makes a big difference. However, if you can't find arbequina, try to a fruity extra-virgin olive oil. How to make Marzipan Christmas trees 🌲🌲🌲 and now you can too. 1. Line and grease a round 9 inch cake pan with a sheet of parchment paper cut to size and a little butter. Place a wire rack at midlevel and preheat the oven to 350F. Dry whisk all the dry ingredients from the flour to the cloves in a large mixing bowl and keep aside. 2. Attach the whisk attachment to the bowl of your stand mixer. Add the eggs, olive oil, molasses, moscovado sugar and miso. Whisk on medium-high speed until creamy for about 4 to 5 minutes. Replace the whisk attachment with the paddle, reduce the speed to medium-low and add in half of the whisked dry ingredients . Whisk on low speed until combined. Then add in the mirin and the yogurt along with the remaining flour and whisk until combined. Scrape the bottom of the bowl using a silicone spatula to make sure there are no visible flecks of flour. Transfer the cake batter to the prepare cake pan and bake in the preheated oven for about 55 to 60 minutes. The cake will done when it is firm and spongy to touch at the center and a skewer comes out clean when inserted into the center. Once the cake is baked, remove from the oven and allow to cool in the pan for 10 minutes. Then run a sharp knife along the edges of the cake to release it and cool on a wire rack. 3. Decorate the cake with the marzipan Christmas trees (See Video Here on how to prepare). Dust the cake with confectioner's sugar as needed. I think potlucks were one of the kindest things invented by man. There are times when I love to cook large batches and several different things for people but I also have moments when I want to cook one thing for everyone. Santa Claus and potlucks have a lot in common except for one little thing, one works year round while the other is on call in December but they both bring us lot of gifts of different kinds to taste and eat. Choices, choices and more! This week, I'm really happy and excited to share this recipe from Kristin Donnelly's new cookbook Modern Potluck Kristin's book gives a breath of fresh air to the traditional potluck and she has recipes that will leave your group of family and friends very happy. There are a lot of fun recipes for everyone and she even has a lot of suggestions on how to plan ahead of time for a potluck. Also, my lovely friend Yossy of Apt.2B Baking Co. shot all the pretty photos in the book!!! Kristin is also giving away 5 copies of her lovely book and in addition, one lucky winner will also get a set of baking tools from Baker's Secret. All you need to do is leave a comment below and tell me what's your favorite potluck dish! The giveaway is open to legal US residents only due to shipping reasons and I will pick the 5 winners after 48 hours. Good luck!!! Update: This giveaway has ended, the winners chosen at random are Diane Salfi (who also wins the bakeware set), Geetha R, Ellen, Tiffani Colson and P.G. Rabon . Please send me an email so I can have your gifts sent to you. Congratulations! I use fresh rosemary in the pie filling. Thyme and lemon thyme are also great herbs to add to this instead of rosemary. If you take this to a potluck, Kristin suggests making the pastry ahead of time and even rolling it out the night before. The baked pie will keep at room temperature for 2 days and refrigerated for 3 days. Another great tip from Kristin, leftovers can be cut and easily frozen and wrapped with clingfilm and then thawed on the counter. I personally, like this warm, so I reheated the pie in the microwave for a few seconds. 1. Prepare the dough: In a liquid measuring cup, combine the water with the vinegar. In a large mixing bowl, whisk the flour with the almond meal, sugar and salt. Add the butter and use a pastry blender or your fingers to work it into the flour until most of it is the size of peas, with a few larger chunks remaining. Mix in the vinegar mixture, by tablespoon, until the dough just starts to hold together with a few dry spots remaining (this will happen at about 12 to 16 tablespoons of water). Transfer half of the dough to a large sheet of plastic wrap and gently knead to bring in any ragged edges. Pat the dough into a rectangle, wrap in plastic and refrigerate for at least 1 hour or up to 3 days. Repeat with remaining dough. 2. Assemble and bake the pie: Remove one piece of dough from the refrigerator and roll it out between 2 floured sheets of plastic wrap or parchment paper until you have an 18X13 inch rectangle. If the dough starts to feel too soft as you're rolling, refrigerate it for 15 to 20 minutes until it forms up again. Fit the dough into a 15X10 inch baking sheet (also known as a jelly roll pan), leaving any excess intact, and refrigerate. In a bowl, toss the peaches with the blueberries, rosemary, sugar, cornstarch, lemon juice, and salt. Roll out the second piece of dough into 16X11 inch rectangle. Spread the filling out in the crust-lined pan. Drape the second piece of dough on top of the filling. Roll and pinch the excess crust inward to create an edge around the pan. Use a sharp knife to cut vents all over the top crust. Refrigerate the assembled pie for 20 minutes. Meanwhile, arrange a rack in the bottom of the oven and another in the center. Preheat the oven to 425F. Brush the top pastry with the egg wash and sprinkle with the turbinado sugar. Bake the pie on the bottom rack of the oven for about 25 minutes. Reduce the temperature to 375F and move the pie to the center rack. Bake for 30 to 35 more minutes, until the pastry is golden brown and the juices are bubbling. Let the pie cool on a wire rack for at least 2 hours before serving. I've been meaning to share photos from my trip to Big Sur for a while but never got to it until now. With groundhog day done, it seems this is the best time to talk about spring and summer travel. Big Sur is a magnificent natural treasures that you must try to visit at least once if you can. In an ideal situation, you have one person to drive while you stare through the car seat window across the massive and spectacular stretch of land that meets the ocean. Big Sur is dramatic and colorful. From the plants that cover the landscapes, to the whales that you might see far into the deep blue ocean or the condors soaring in the sky, Big Sur is every bit a jewel of the west coast. Though, we didn't spend the entire weekend at Big Sur, there are plenty of places you can rent and stay the entire weekend. We did however, make a mandatory stop at the famous Big Sur Bakery and we were glad we did! We had a small snack at the bakery and later ate dinner at the restaurant. We ordered the steak with shaved wasabi root, the shishito peppers and sea bass with risotto. You know your fish is cooked to perfect when it falls off like a soft buttery flake. For dessert, I got the lemon ice cream pie, it's very lemony and citrusy with a delicious pistachio crust. Just a little tip, even though we made reservations online at the Big Sur Bakery's website, their kitchen was closed when arrived for lunch. I highly recommend trying to call them up to make sure they actually have their kitchen open for the hours you want to visit . We did call in advance but couldn't seem to catch a hold of them but they were very apologetic and nice. We ended up staying there for dinner which as I said before was well worth it! I'm going to stop talking and let you take a look at Big Sur. You can never predict whether it will be warm, hot or chilly. Windy days aren't too bad but they happen often. When it comes to food options, it's rare that you can go wrong. The city has so many tasty options for different price points and for different diets. My life involves food, a lot of it. But I find it interesting that this city and the people here, are hugely, food centric. It comes up in a lot of conversations and rightly so. Food trends are innovative from both a culinary perspective and a technological one. Since, I've been traveling a bit for the past few weeks (house hunting, work stuff, etc) and also avoiding the heat wave that's hitting this side of the world, I've been focussing on easier and less time consuming items to cook at home. This desserts falls right into that category of easy-to-make, less time consuming and incorporates seasonal goodness in the form of ripe and sweet yellow peaches. I start by infusing Califia's unsweetened almond milk with two types of cardamom, black and green along with crystallized ginger and a few threads of saffron. Once the infused almond milk is completely cooled and chilled, you can either drink it directly or you could make this super easy peach and cake trifle type dessert. Peaches are one of the best gifts of summer and with a light vanilla flavored cake such as angel food cake or a pound cake, you will have the easiest and fruitiest dessert to serve your friends and family and one that requires very little effort! If you use the sweetened almond milk from Califia make sure you adjust your sweetener levels accordingly when preparing the milk. I suggest using sugar or honey but feel free to use your favorite sweetener. The amount of saffron I use to flavor the milk is a very tiny pinch and you will get a very tiny tinge of yellow color. Adding too much saffron can make this milk taste unpleasant. I love yellow peaches because they are sweet and when ripe their texture is soft. You could use something firm like a white peach but I find that doesn’t play well with the texture against the cake. The cake: Here you can play around a little. I like angel food cake and vanilla pound cake to keep it simple. This way the spiced milk and peach flavors don’t get mellowed out by whatever might be in the cake. To kick things up a notch, you can also grill the pound cake or toast it a little before adding it to the dessert. I like to leave the ginger behind in the milk when I serve the dessert but if that’s too intense then you can remove it. Place all the ingredients from the almond milk to the saffron in a thick bottomed saucepan. Heat on medium-high heat and bring to a boil. Reduce the heat to a gentle simmer and cook for 5 minutes. Remove from stove, transfer the milk with the spices into a container, cool to room temperature and then refrigerate for at least 6 hours or until chilled. Peel the peaches and slice in half to remove the pit in the center of the fruit. Quarter the peach and then cut each quarter into half. Drizzle the lemon juice over the peach segments and allow to sit for 2 minutes at room temperature. When ready to serve, toss the peaches with the cake pieces carefully in a medium-sized mixing bowl. Divide this equally between 4 glasses or serving bowls. Remove the cardamom pods from the chilled almond milk and discard the pods. Shake the milk and pour over the cake and peach mixture in each glass. Add the leftover ginger bits from the milk on top of the cake. Serve chilled and immediately. I stare into the empty vacuum, it's a soulless void, a black hole that holds nothing. Happiness is non-existent and it looks sad. Yes, that's what's inside an empty cone, when I look into it. While cleaning out one of the cupboards in the kitchen and I found a few cones sitting sadly, all forgotten. They needed a soul in the form of something sweet and frozen. To fill this empty cone, I made ice cream over the weekend. A thick and creamy ice cream with streaks of sweet and tart red cherry sauce embedded in a white, creamy soft frozen bed of labneh ice cream. On it's own, creme kefir/labneh (labne) is very tasty. Smooth, creamy with the tanginess of yogurt and a velvet texture to go along with every loaded spoon, that's the best way I think I can describe it! Combine this with the sweet and tart flavor profile of cherries and it's an ice cream that I want to eat all summer long. Cones or no cones! With cherry season in full swing, you might want to take advantage of all the fresh fruit that's available for the next few weeks (I really hate that it's a short season) but for those times when you can't find fresh cherries this recipe can be still be made if you can find the frozen ones at the store. I have some exciting news to share with you, I'm a contributor at Team Yogurt and if you like yogurt and are looking for fun and new interesting ways to incorporate it into your diet, head over to my friend Cheryl's site for a whole collection of recipes from some very amazing and talented people. You'll be pleasantly happy to see recipes from all over the world that you can try out at home that are easy to prepare and tasty to eat! It is critical to have everything chilled when adding the acidic labneh kefir to the ice cream base. Otherwise things can curdle. Move quickly once it is added and pour it into the prepared frozen canister of your ice cream maker. After you add the cornstarch slurry to the ice cream base you can pass the ice cream base through a strainer to remove any clumps. Frozen cherries will save you a lot of extra time and hassle. But you can use fresh seasonal cherries too, just remember to chill the sauce before folding it into the ice cream base. Kirsch helps to amplify the cherry flavor in the ice cream but it also helps prevent ice crystal formation during freezing. The sauce I use in this ice cream is very simple to make and doesn't require any cooking. 1. Place the 3 cups milk, heavy cream and sugar in a thick-bottomed deep saucepan. Heat the contents of the saucepan on medium-high heat and bring to a rolling boil. Stir occasionally with a silicone spatula to dissolve the sugar. 2. While the milk is boiling, quickly make a slurry of the cornstarch with the 3 tablespoons milk. Quickly whisk this slurry into the boiling milk and allow to boil with constant stirring until the mixture thickens for around 2 minutes. Remove the saucepan from the stove and transfer to a clean gallon ziplock bag and chill completely in an ice-water bath for 35 minutes. 3. While the ice cream base is chilling, place the labneh kefir in a large mixing bowl. Whisk it for 30 seconds and then pour in 1/2 cup of the chilled ice cream base along with the vanilla extract and 2 tablespoons of kirsch. Whisk to combine. Then slowly whisk the mixture in the bowl until it is smooth and combined evenly while pouring the chilled ice cream base in a thin steady stream. Pour the entire chilled mixture into the prepare frozen canister of your ice cream maker. Follow the manufacturer's instructions to churn the ice cream. 4. In the meantime prepare the cherry sauce. Place the frozen cherries (note if you use fresh cherries, then prepare this sauce and pre-chill for at least 1 hour before folding it into the ice cream base) in a blender. Add the remaining kirsch and honey. Pulse until combined (about 30 seconds, three times). Remove and transfer the sauce. Keep chilled until ready to use. 5. Transfer half of the ice cream into an airtight freezer safe container. Pour half of the chilled cherry sauce over the ice cream and half of the chocolate chips. Repeat the layers with the remaining ice cream, cherry sauce and chocolate chips. Using a knife or spoon, stir the mixture to create swirls of cherry sauce and ice cream. Don't over-mix or you'll end up with a uniform pinkish ice cream. (the swirls make the texture more interesting, both visually and taste-wise). Keep in the refrigerator for at least 4 hours to firm up before serving. One of the most popular meats to eat grilled or watch people barbecue in their homes in India, is probably without a doubt, tandoori chicken! It's definitely popular because it is also one of the most requested recipes I've been asked to share and I finally pegged a recipe that I love that tastes good and is easy to make. Tandoori is derived from the word tandoor or the large clay oven where long skewers of marinated meat and poultry are cooked to perfection and where deliciously blistered pieces of naan (Indian flat bread are cooked). 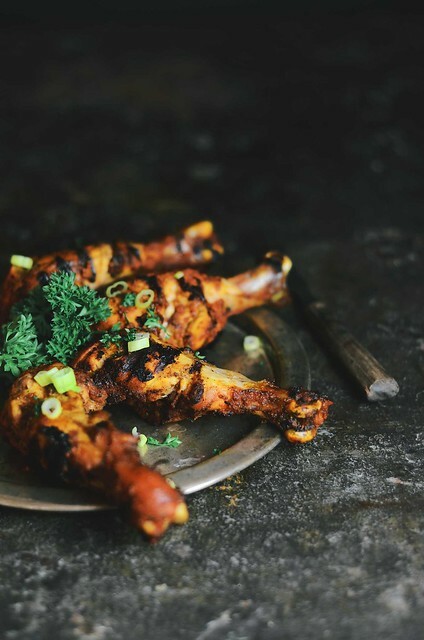 We never owned a tandoor at home (they can be pretty huge) and most people in India don't but there are a few tricks to make this popular chicken dish at home. Instead of using artificial food colorings to give the chicken its traditional red color, I used a beet which does work very well without affecting the taste though I will admit, I wish it were a deeper shade of red. However, too much beet could also end up sweetening the chicken which is something I wanted to avoid, the marinade gets a deep dark pink color and you will be able to smell the fragrance of the freshly ground spices in it. To cook the chicken in two stages, bake first and then broil to get those characteristic tandoor marks on the chicken. 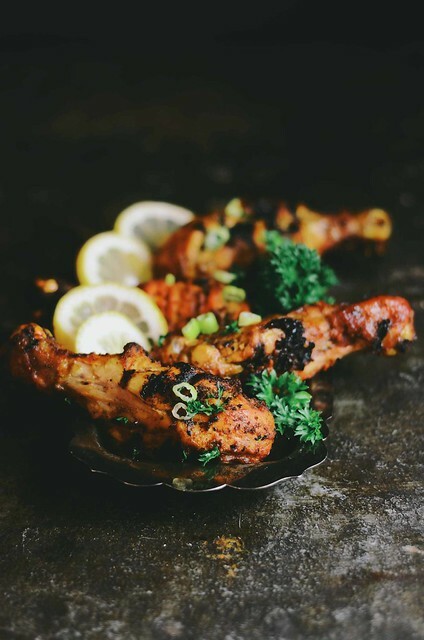 A good piece of tandoori chicken is succulent and juicy with complex spicy flavors mingled with notes of fresh lemon juice, spicy and sour all rolled into one. My version of tandoori chicken calls for a large amount of chicken as you will see below but this way you can prepare the marinate the chicken ahead of time and freeze some for later. Just thaw a batch in the refrigerator before you are ready to cook. Freezing the chicken in batches is also a great way to save some time over the week. Serve your tandoori chicken with flatbreads such as naan, roti or rice, a refreshing salad and some plain yogurt. My instructions here are for the oven but you can also toss these on the grill to cook them. 1. Remove any skin from the chicken, rinse under cold water and pat them dry with a clean paper towel. Make two deep slits across the flesh of each chicken drumstick and keep aside in a large mixing bowl. 2. Using a food processor/blender/immersion blender, pulse all the ingredients from the yogurt to the salt until completely smooth. Pour the marinade over the chicken and coat the meat evenly. Cover with cling film and allow to marinade in the refrigerator for at least 6 hours (maximum overnight) before cooking. (At this point you can do what I did if you don't want to cook all 6 lbs of chicken, I divided the marinaded chicken after 2 hours and froze half of it in a ziploc bag, the rest I kept to marinate). 3. Place one wire rack in the middle of the oven and another rack closest to the top and preheat to 400F. Line a baking sheet with parchment paper and place about 6 pieces of the chicken drumstick about an inch apart from each other. Pour about 1-2 tablespoons of the left over marinade from the chicken over each piece of meat and cook in the oven on the middle rack for about 30 minutes, turning the chicken pieces over half-way through the cooking. The chicken is cooked when the internal temperature reaches 160F. At this stage, immediately switch the broiler on and transfer the rack with the chicken to the top shelf. Broil for about 3-5 minutes until the chicken pieces get slightly charred. Remove the chicken drumsticks and place in a plate, cover and allow to rest for 2-3 minutes before serving. Squeeze fresh lemon juice over the tandoori chicken before serving. 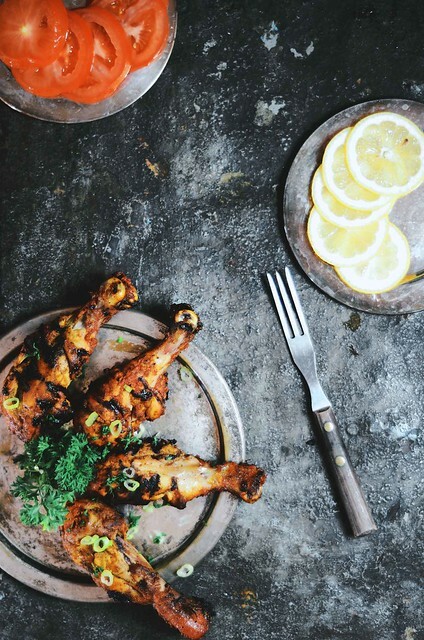 Cook the rest of the tandoori chicken drumsticks and serve similarly. I entertained a childish fantasy that involved owning a garden that resemble a fancy oasis with trees and plants laden with figs and pomegranates and of course, a water fountain! In DC, I took active steps to achieve this, I planted a few fig trees and one pomegranate plant among others. 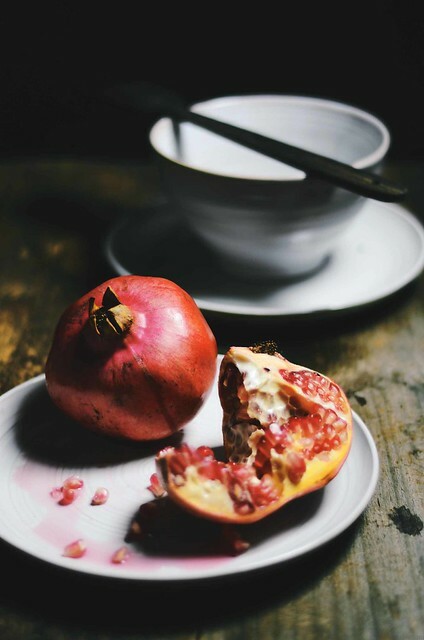 For four years, the pomegranate tree would grow bigger and shoot out more branches and each spring as soon as the leaves came back, I would tell myself this would be the year where I'd get beautiful bright orange-red flowers that would turn into pomegranates. Nothing, zilch, nada! When we moved, I was happy to part with it and gave it away without any tears. Unfortunately, that bug of envy is back because here in California, it appears that every garden I pass by is lined with pomegranate plants fully loaded with flowers and fruits. Garden envy is a hard one to fight and I have a strong feeing that by next spring, I'll be back to owning a new plant, maybe this time I will have some luck? 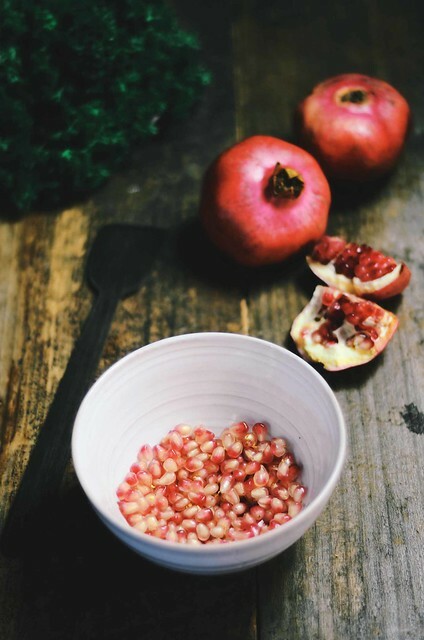 Pomegranates remind me of fall more than pumpkin spice lattes and all things brown and orange. They stand out with their bold colors and flavors and with their unusual texture. Every aril in that pink fruit is packed with a sweet and delicious tart flavor that is simply waiting to burst. Indian street food is amazing and I talk a lot about it, especially chaat. 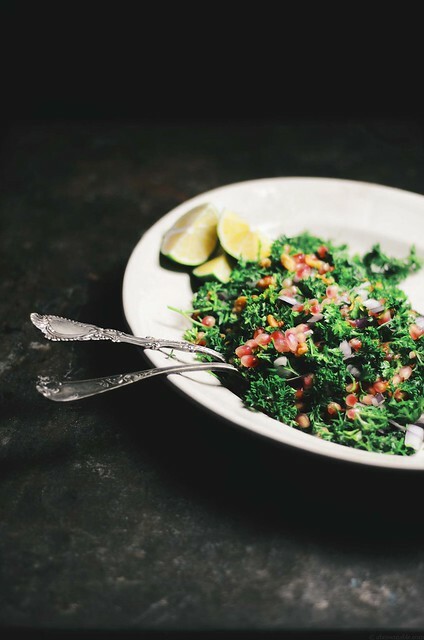 Here in California we are lucky because there are so many chaat restaurants that we can indulge in This salad has a lot of those fun flavors with fewer spices and is one tasty dish. I sometimes make this with fresh cilantro but this time I used parsley so you can use either or even a combination of both, it is great either way. 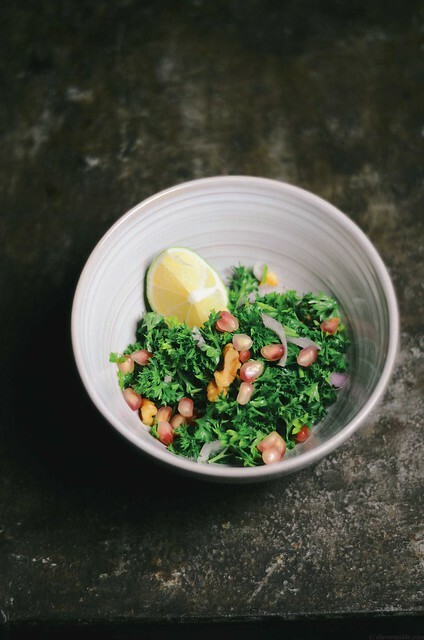 Fresh lime juice, pomegranate arils and a dash of freshly roasted spices along with a few walnuts make this one perfect bowl of color and flavor. 1. 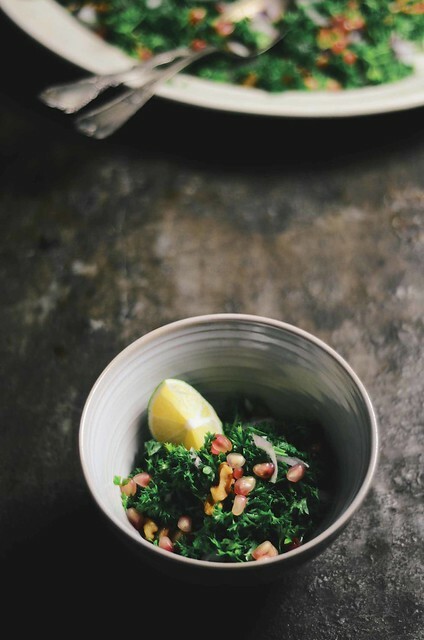 Chop the parsley leaves (you can chop them coarse or fine) and place them in a large bowl. Add the pomegranate arils along with the red onion. 2. Chop the toasted walnuts (nuts) and add them to the rest of the ingredients in the bowl. 3. Add the cumin, coriander, and cloves to a small saucepan and toast for about 30-45 seconds on a medium-high flame. The cumin and coriander should become slightly brown and you will immediately notice an aromatic fragrance. 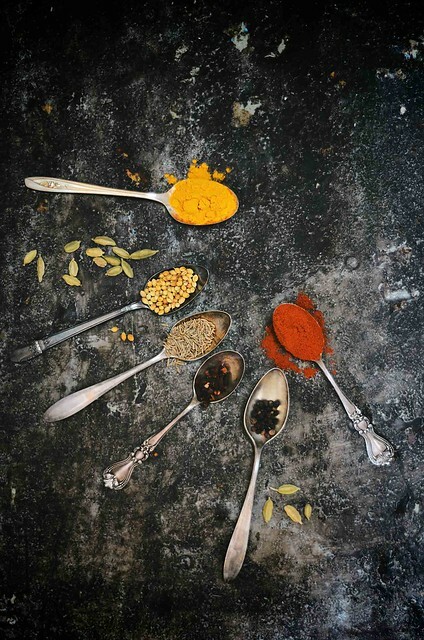 Remove from stove and grind with a mortar and pestle or in a spiced grinder to get a fine powder. 4. Squeeze the lime juice into a small mixing bowl, add the salt, pepper, sugar, chili and 1/2 teaspoon of the ground spice mix from step 3 (store the rest of the mixture in an airtight container). Stir the ingredients with a fork until just combined. Pour this dressing over the ingredients in the large mixing bowl and toss to coat completely. Allow to sit for 10 minutes before serving, this salad can also be served chilled.